whyBaby is a baby sleep analyzer, monitor, and snoozing companion. Six sensors act in harmony to track baby's sleep and show a star-field. When I started this project, I was about to become a dad for the third time. This gives me gives me both, experience and necessity as I experienced the shortcomings of the baby monitors on the market and, now that baby Braden is here, I need to get more sleep! Before we delve into what whyBaby is, let's examine the options that currently exist on the market and why they just are not good enough. There exists three categories of monitors: audio monitors, video monitors, and motion monitors. All three preform their duties sufficiently, however, they are poor at handling other tasks. For instance, the motion monitors and video monitors incorporate audio, but the quality is sub-par, and the simple audio monitors only handle one task. Another problem with these systems is that they are active devices that require constant monitoring. There is very valuable information that can be obtained passively. whyBaby is an attempt to rectify the issues that plague the existing monitors while employing passive data collection to help better understand baby's preferred sleeping environment. This was my first attempt at hardware hacking with a RPII, so much of this was trial-and-error. In addition, I have only previously done a couple of minor digital hardware projects - nothing to the scale of this. whyBaby uses a Raspberry Pi II with an image of Windows 10 IoT. I found that the easiest way to use the GPIO pins is to use a T-Cobbler Plus. This allowed me to utilize a breadboard and read the pins easily. Next, we need to connect the analog boards. To do this, I'm using a MCP3008, which is an 8-Channel 10-Bit ADC With SPI Interface. 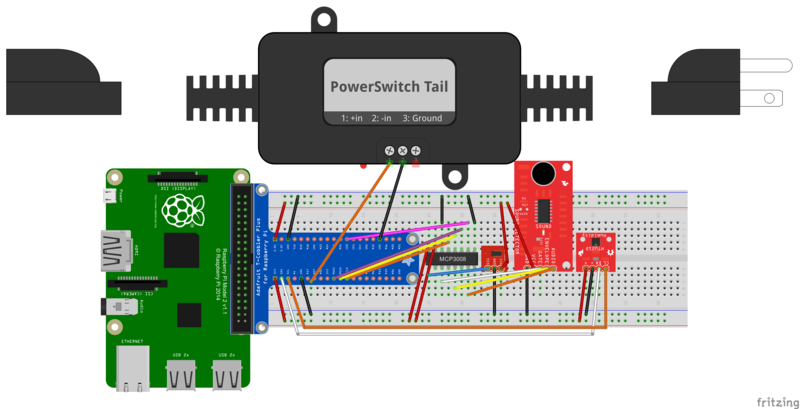 The next thing that I did was connect up a very cool device, called the PowerSwitch Tail II. This allows one to safely power on/off an AC device via a 3v3 signal. I plan to use this to power on a star-field projector when the audio reaches a particular level. Simply connect the #1 pin to #27 on the cobbler and the #2 pin to GND. A library to communicate with and read the HTU21D. I found a weather station hackster.io project that contains code to control the unit here. A page so that you can visually examine the values as they are being collected (I also put the collector code in here). A simple object class that we will serialize to send to Azure Event Hubs. An Event Hub helper class to actually send events to Azure. Besides the SPI initialization, the rest of the work is done in a timer click event. The light, audio, gate, and envelope code is all similar except for the channel address. The output gets sent into an Azure Service Bus Queue, which gets picked up by a simple Azure worker role. Incorporate a load sensor to determine if he leaves the crib, stops breathing, etc. Use the aggregated data to determine when to turn on the star-field. Currently, it turns on when the audio reaches a certain level. Incorporate video. Currently, Windows IoT does not support the Raspberry Pi camera. When this is supported, I will set up a video stream so we can monitor baby Braden. This is the object class that we populate for sending events up to Azure. Helper class for sending events to Azure.